We are excited to introduce MoldX® A110 optimized ATH for SMC, BMC and hand lay-up applications. 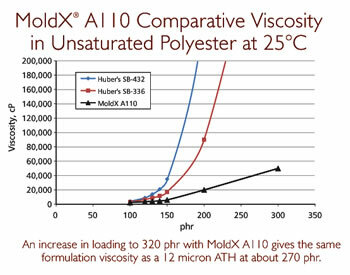 MoldX A110 is capable of very high loading levels, from 250 phr to 350 phr. It is the ideal choice for halogen-free product formulations requiring significant smoke suppression. The low-viscosity performance of this ATH fire retardant means it can be processed on SMC machines and BMC mixers at loading levels not thought possible. The outstanding flow characteristics of MoldX A110 make it especially well-suited for molding large or intricate parts. For more information or a sample, Contact Us!